IHeart Organizing: Home Office Month: Let's Get This Party Started! 35 Home Office Month: Let's Get This Party Started! The day I have been waiting for all month long is finally here! It's time to party, celebrate and share all of your successes and hard work this month! I absolutely can't wait to see what you fine folks have been up to! This month we have tackled our paper piles head on, managed our budgets, maximized our storage, organized our messy drawers, dared to DIY and played with crafts, papers, glues and paints! I hope y'all had as much fun as I did! Above you can see the projects that I took on this month: Organizing Greeting Cards, Conquering Paper Piles, DIYing Drawer Dividers, Creating a Budget Binder, Labeling Cords and Creating a Place for Memos. But enough about my projects. This day is about YOU! So LET'S GET THIS PARTY STARTED! 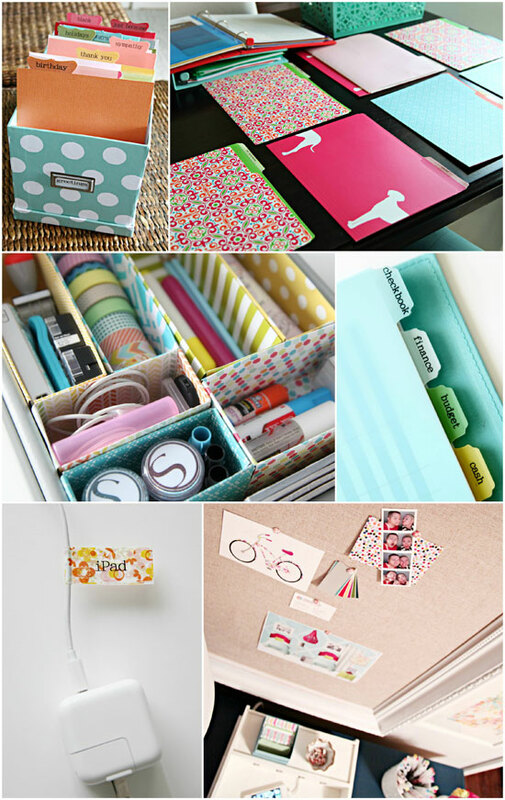 Whether you gave your office a face lift, organized a drawer, sorted your file cabinet, DIY'd a pencil holder or even added some inspirational art, I want to see it! And of course I know how busy everyone is so this party is open for a good long month, which will hopefully give you time to finish up your projects or even whip up a few more based on the additional inspiration you found within the link ups! A huge THANK YOU to everyone who participated, shared your ideas, tips and tricks this month! Every month we are tackling different projects and spaces around the home, to get organized one space and one project at a time. You can check out the introduction to Home Office month here. Thanks for hosting this lovely linkup! Where did you get those cute file folders? Thanks for hosting this link-up. Can't wait to see what everyone has been up to! Just wanted to let you know how much I've loved this month's series of posts - organising heaven with so many fantastic ideas and cuteness. I made up a discbound planner using your post as inspiration and I love it! Just after I finished the planner I finally succumbed and got myself a smartphone so thought it might make the planner redundant (and make me feel bad for wasting money) but it looks like I'm an old-fashioned paper and pen girl at heart. The phone's good for some things but I like to be able to see all sorts of info at a glance and that's when the phone gets beaten hands down as its too hard to work with. I hope there will be more monthly organising series like this one! Thanks for hosting! I always enjoy your blog and how many colors you use in your projects. So pretty & bright! Thank you for letting us all share our projects, Jen! I'm excited to check out what everyone has been doing for Home Office Month! Thank YOU for inspiring all of us! Thanks for a great link up! There are already such wonderful ideas linked up! So many great ideas. I have a lot of work to do. I am moving to a new house in 2 weeks and want to get set up in an organized way. So many awesome projects! I can't wait to browse through the links! An organized home office is so important to an organized life! So many great ideas! Jen thanks for your inspiration & for the link party! I only found your blog during the month of January, so have missed most of Home Office Organisation Month but I absolutely cannot wait to see what we're organising in February - I'll be right there with you! I'm off to get inspired by the gorgeous blog posts above now and will be waiting impatiently for the Feb challenge - lol! Thanks so much for hosting! You blog is so inspiring!!! Gosh! We've had an empty office space since we moved into our house about a year ago! When I first read your post about the office being the monthly challenge, I couldn't help but to jump right into the project planning. It's definitely a much needed space around here. So after my husband and I agreed it was time to create our office, off to the store we went and ordered our desk. I'm now happy to report that it was just delivered yesterday. Hopefully, we'll have the opportunity to finish the office challenge just before the end of your linking party. Thanks for all your inspiration! Love your blog! Thanks for hosting. Thank you so much for hosting Jen! I made a decision a few months ago that I would get our home organized and I loved having this challenge to help me through. Your blog has sooo much inspriation!! I have taken your challenge and ideas and did a whole office make over. I'd love to share my before and after pics with you! Are you taking submissions? Well, I've been reading all month with great intentions, but this month has been crazy. I did, however, manage to go through some recipe clutter (physically and on my computer), so that counts, right? I'm glad you're leaving the linky up for a while. I will definitely be making some progress in the next couple weeks. That was really satisfying. Can't wait for this month's challenge! Wow! Look how much was accomplished! All so beautiful and organized! I love seeing all of your ideas and organization! Everyone has done great things! Thanks for sharing! So many great ideas and inspiration from everyone! We painted our office closet but this is motivating me to finish setting it up!